UNICOO- kids Learning Stool, Kids Kitchen Step Stool, With Safety Rail-Solid Wood Construction. Perfect for Toddlers . 1. 30 days free return and life time free parts. 2. Return product must with the original package, otherwise we will charge 20% restock fee. MUTI-FUNCTIONS: Elevate your baby to counter height. Kids can help out in kitchen: baking, mixing, preparing food, cleaning up, or other hands-on situations. It will make your kitchen full of fun! You could also put it in washing room so kids can brush teeth by themselves. MATERIAL: It's made from solid Hardwood and carefully coated with durable, nontoxic, lead-free coating. SAFTY STANDARDS: The four-sided railings provide perfect support when your baby inside. "A" shape seating make sure no fall over risk. SATISFACTION GUARANTEE - Unicoo committed to our customers. 30 days free return and life time free parts. 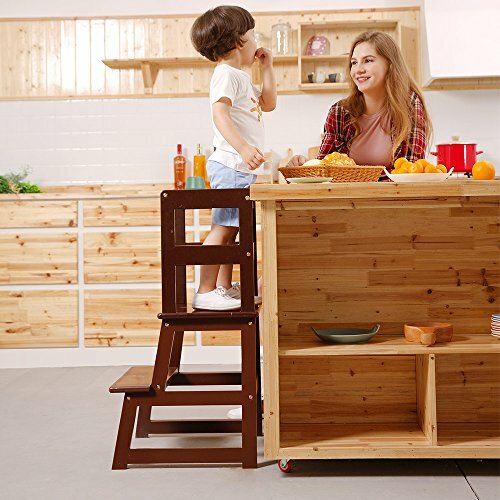 DIMENSIONS: This step stool suitable for 1~5 year's old kids, 150 LBS load-bearing. Installation needed assembled dimensions: 18"L x 18.1"W x 34.8"H.